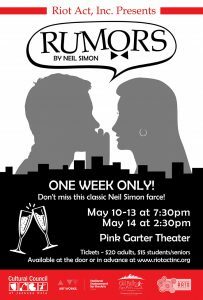 Rumors by Neil Simon – Riot Act, Inc.
Riot Act Inc.’s third production of our 14th season, Rumors by Neil Simon, runs May 10-14 at Pink Garter Theater. One Week Only! Helmed by director Cynthia Huyffer and assistant director Deborah Supowit, Rumors boasts a wonderful cast including Lindsay Burgess, Margaret Gordon, Leif Huot, Graham Koten, Patrick Nolan, Cody Jo Salaz, Heather Smith, Ann Marie Wells, Pierce Wilfong, and Michael Yin. Brand new, re-designed Riot Act, Inc. T-shirts and Run of Show Raffle tickets will be available at the concession stand before each performance and during intermission. Raffle tickets cost $5 for one or $20 for five.